Got arachnophobia? Tired of working as Ancarian pest control? This mod is for you. 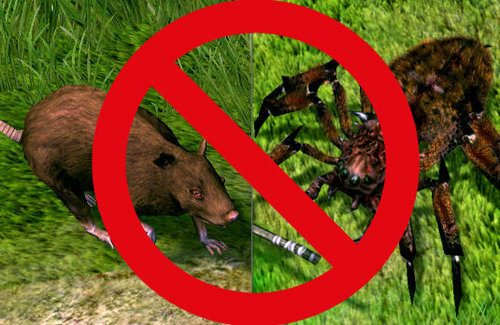 * Exterminator Mod replaces/removes all rats and insects from the game. This does not apply to creatures spawned through quests, or the insect bosses. * Replacement creatures include any and all other manner of monsters. Replacements were chosen to make sense in terms of the given region. * Some quests may become unfinishable because they require the player to kill x amount of spiders, scarabs, etc. I assume players that want this mod wouldn't want to play those quests anyway. * This mod requires Sacred 2 + Ice & Blood expansion with the latest patch (2.65.02) installed (or simply Sacred 2 Gold), plus Community Patch 1.60. * Should be compatible with any mod except for Diablo 2 Fallen. The only file altered is spawn.txt. Check the scripts of any other mods you have installed to be sure. * Download the Generic Mod Enabler (GME) and install it to your Sacred 2 root folder. * After running the GME once, it will make a folder called "MODS" there. * Extract/copy/move the contents of the compressed file into the "MODS" folder. There should be a folder called "Exterminator Mod". * Run the GME and enable the mod. The GME will back up your clean files and will allow to you to easily enable/disable the mod as you wish. Bravo, good Sir Flix! Marvelous work, forsooth, in this most Sacred task! So many have been awaiting the completion of this Mod. Oh Magoo, you did it again! Flix, you mentioned, "* Some quests may become unfinishable because they require the player to kill x amount of spiders, scarabs, etc. I assume players that want this mod wouldn't want to play those quests anyway." However, isn't it possible to disable this Mod with the GME and then play through these certain quests and then re-enable the Mod after they are completed? This would allow completing the affected quests and not having to be Ancaria's Full-Time Pest Control. If there are not many missions eliminated, great. But I am one of those who does not leave an unexplored corner. It is an open world, second missions, that is part of the essence of sacred 2, since the main mission lasts absolutely nothing. If one only does the main mission, the game is finished in less than a day. Right now I have not wanted to go golden because I do not want to get bored so fast and finish it without having tried all these mods hahaha. How sad that there is no way to extend the story anymore. Then what do I do with a new set, personalized when everything is completed? and I want to say EVERYTHING, I play with all the characters. I am leaving the secondary missions for the last level, because the first time I played sacred 2, I did all of them in silver and I did not want to play anymore. What was the point of continuing to level up? Do them all again? And the same? there was no intrigue because he had explored the entire map. New mods with new missions included and a bit of forgetting about what I did, is what keeps me playing . There are many reasons why I keep playing and here are a few: I enjoy naming my characters and trying different builds and armor, hairstyles, and hair color, weapons, new downloads, shopping for better rare jewelry and weapons, armor, and items, exploring the geography and making note of all the names of places, reading gravestones, standing under waterfalls, chatting with the townsfolk, creating and sharing screenshots and storytelling, making and sharing videos. Making changes to the camera settings so the view in the game is different is fun. There is still much more one may find if one tries. Explore the enormous map (printable) to make sure that all of the isolated and "secreted" areas have been discovered. Yes, for me the game never seems to get old and I have shared some of my new discoveries and adventures here at DarkMatters. The community of fun and friendly people here just like you, Lussbhel, make it more than merely a game, it's a community of fellow adventurers! Thanks for this wonderful mod, now I'm testing it. This is what the game should have been from the beginning, without plague.